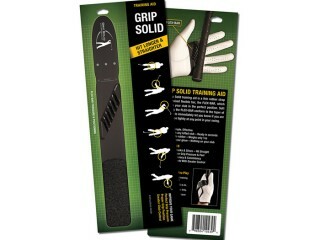 The award winning Grip Solid® Golf Training Aid is a thin rubber strap with a raised, flexible bar, the FLEX•BAR™, which positions the golf club in the perfect position. Soft fins along the FLEX•BAR conform to the taper of the club to immediately let golfers know if they grip too tightly. 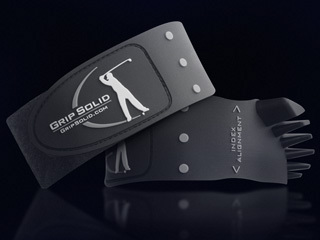 Worn over the glove, Grip Solid ensures proper grip pressure and grip position to help golfers develop accuracy and consistency. 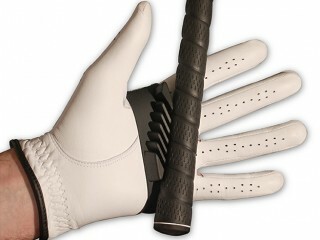 With Grip Solid golfers can practice while they play with any club to improve distance and control. Designed and patented by Michael Newman and manufactured and marketed by Pomp Productions, Grip Solid won the prestigious Best New Product award at the 2011 PGA Expo. The design is an innovative, one-size-fits-most solution made of injection molded rubber with sewn hook and loop fabric closures. Grip Solid is packaged in a unique die-cut, tri-fold sleeve allowing customers to feel the FLEX•BAR without opening the product – When unfolded, the packaging reveals step-by-step instructions. Perfect at point-of-purchase display, the product was specifically designed with space-saving packaging for economical shipping at volume and for direct sales. 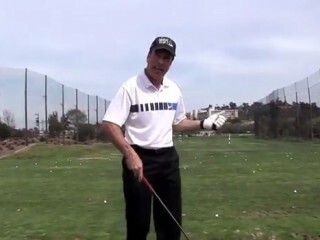 Since its 2011 debut, Grip Solid has been featured in publications such as Golf Digest, Golf Tips and Golf Illustrated and continues to receive rave reviews from golfers around the world. The Grip Solid patent covers a wide range of sports, such as baseball and hockey, and is currently available for licensing.